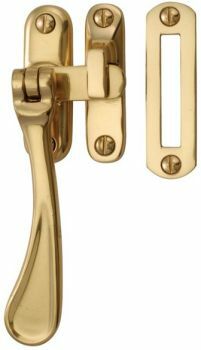 Solid brass spoon pattern casement window fastener, by Heritage Brass, with hook and mortice plates. Length 126mm. Available in Polished Brass, Polished Chrome, Satin Chrome, Antique Brass, Satin Nickel, Polished Nickel, Satin Brass & Matt Bronze.